No one wants to dwell on the negative, but if a disaster strikes—whether in the form of a wildfire, hurricane, or something else entirely—it's best to be prepared. The biggest step you can take toward being prepared is creating a home inventory, which will help you get reimbursement from your insurance company for any lost possessions. Having a detailed inventory makes it easier to file an insurance claim and will help your claim get processed quickly. A good home inventory will include a detailed list of your belongings, including descriptions, photos or video, receipts, serial numbers, date of purchase, value—and anything other information that could help prove what you have and what it's worth. You should inventory all big ticket items, like electronics and furniture, but it's also important to take inventory of smaller things that could need replacing in the event of a disaster, like clothes and dishes. And, whenever you buy something new, be sure to update your inventory so it's always current. Still not sure where to start? This checklist from State Farm gives you a good outline of inventory basics. Collecting all of that information may sound like a daunting task, but fortunately there's tech that can help: cloud services will keep your data accessible wherever you need it and apps can make creating your home inventory a snap. Before you get started with your inventory, you should check with whichever company provides your home or renter's insurance. If they have any specific reimbursement requirements, it's important to be aware of them for your inventory. Your insurance company may also have their own tools you can make use of—and you may find it more convenient to use an insurance-provided tool that will be sure to collect any specialized data your insurance company might need. Best of all: these tools tend to be free, even if you don't hold an account with the company. Allstate Digital Locker works on the web, iPhone, or Android. State Farm HomeIndex works on the web, but can easily be accessed by a mobile device, too. Liberty Mutual Home Gallery lets you take a photo inventory using your iPhone, iPad, or Android device. Know Your Stuff is a free online inventory service provided by the Insurance Information Institute. The site will walk you through configuring rooms in your home and listing the items each, complete with photos and receipts for documentation. Because the site walks you through everything you need to enter, you can be sure you're recording all of the right information. And, everything is stored online, so you have easy access to your home inventory from anywhere you have an Internet connection. Even though an online service makes things easier than keeping an inventory on paper, it can still be frustrating to have to photograph all of your possessions and attach those photos one by one to your inventory. To simplify things, Know Your Stuff also has a free app for iPhone and Android phones. 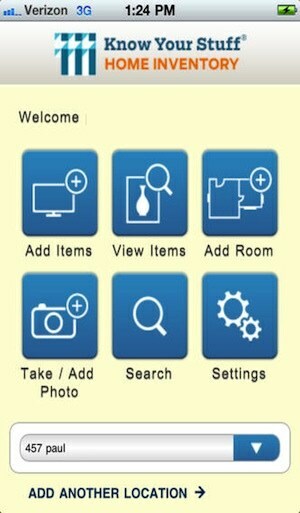 Using the app, you can modify or add to your online inventory—and easily add photos directly from your phone. Though there are plenty of options available here, Know Your Stuff has the most comprehensive toolset that's available on the web or your mobile device, which makes it our pick for the best digital home inventory service. Don't want to learn a new app? If you don't feel like learning an entirely new piece of software to get your home inventory done, that's fine. You can make a home inventory with plenty of different applications—all you really need is a document listing items, values, and serial numbers as well as a place to store photos of your stuff. Here are a couple of common applications that could pull double duty to manage your home inventory—but if you aren't already using these apps for something else, using Know Your Stuff will probably be the easiest way to go. Evernote and OneNote let you organize photos and text documents across the web and your mobile devices, which makes it a great way to store inventory photos alongside notes containing additional information. Evernote is available for iOS, Android, Windows Phone and Blackberry devices and as a downloadable desktop app. OneNote is available for Windows Phone, Windows RT, Android, iOS and mobile browsers can access OneNote web app. A desktop version available as well. Google Docs is an online word processing tool that lets you create a basic list of your belongings—and, while it's not the best place to store images, you can add images to your documents for a complete inventory. We've given you a few great options for creating your home inventory. So, if you don't have a home inventory, put it on your short list. And, whichever service you choose, be sure to be comprehensive and keep it up to date—you'll be glad you did if you're ever faced with filing a claim. You completely left out collectify.com. For over 20 years it has been organizing collections, and for several years has offered a home inventory system as well. Their software even includes room diagrams, so you can exactly pinpoint each item! Pictures, descriptions, values, etc.—all are included. For years they partnered with Chubb, so they know exactly what the insurance industry needs. You forgot to mention my favourite home inventory app. Enclircle uses pictures to capture hundreds of assets at once. It’s much easier to use and way less time consuming than Know Your Stuff. Before going too far down the road with “KYS”, know this stuff: The pc app can only display 25 items per screen (in the best case) and can only operate on (sum, sort, download) what is visible. E.g. “Sort” on the “Replacement Value” field and it will only sort the Items visible. Not helpful if you’re trying to find the items that still need to be priced. Same for export. KYS can export to csv but it will only export one screen per download. E.g. 53 Items in your “Kitchen”? Three files. The pc app is also painfully slow in updating. The iOS app is handy in that you can take a picture and then build the Item around it. But it doesn’t have all of the fields, including the key “Replacement Cost” field. That requires an edit of the Item from the pc app. Finally, and most concerning, is that I’ve sent 3 “anybody home?” e-mails to support without a response. Is Your Stuff "Their Stuff"
What are the chances of KYS becoming SYS, “Steal Your Stuff”. How secure are these apps from being hijacked while away from home? What are the disclaimers and guarantees? I am sorry we missed your Home Inventory app review with our October introduction of ListStuffFast. We took the approach with our new app of making it one that would really be used vs. a wish list of incredible detail on each item from insurance company apps. Not that you can’t enter that info if it is readily known, but ListStuffFast let’s you catalog your home through photos and add the details by tagging multiple items in each photo, including all the details you want, or don’t. The tagging is actually kind of fun to do, so can be added over time if one wants. But we think one should add the details ONLY IF you need to, or want to. We take this approach because for many, it is too big of a job for the slight chance of disaster. Taking photos of each item, model number, make, purchase price, condition, etc. is too much time taken for most, for every item in a home. We also send twice a year reminders to review and update the photo inventory. Soon it will be uploadable to DivvyMaster.com as well where more services will be available to help complete the list, access online appraisals, divide estates or divorces, etc. If you would like to test it, we have a few app store free codes left. Just let us know. 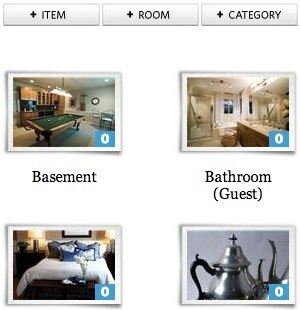 This is(HomeStar Professionals) wonderful website to manage your home inventory. They have apps too. Awesome solution for home owners. I generate report whenever my agent asks. the report is awesome, also i can secure my home and other documents safely. i can download it when i need, i can add my family members to add their items’ themselves etc., they have great solution. im using it daily. Know Your Stuff app is FULL of problems. And their customer service is essentially nonexistent. Last time I had problems, it took 2 months of MANY email and tweets before they responded, and then they just shrugged and said they couldn’t help me. I wish to god I had used a decent program for my home inventory, rather than spending over 50 hours inventorying everything using this piece of junk. I agree here, just transferred all my data (Slowly) to KYS and then used the app to add extra. It takes about 3 minutes to load the items screen each time you do anything. Back to the drawing board. Good post, thanks for the tips. You should also keep an inventory when buying renters insurance with the items’ approximate values.